One of the features we’re most proud of at OptinMonster (besides our innovative and advanced targeting features) is that we make it easy to build your list, no matter which email marketing service you use. We offer dozens of native integrations for all the most popular email marketing services, plus the option to connect with any service using a custom HTML form or powerful webhook that uses Zapier to connect with over 500 apps. Today we’re happy to announce our latest native integration with Sendloop. Sendloop makes smart email marketing easy with their marketing automation tools, reliable email deliverability, and beautiful templates and drag-and-drop builder. Now, with the new native integration, it’s easy to select your Sendloop list right from the OptinMonster campaign builder. You can also easily set up name and phone number custom fields so they’ll be available in your SendLoop account when viewing the subscribers of your mailing list. 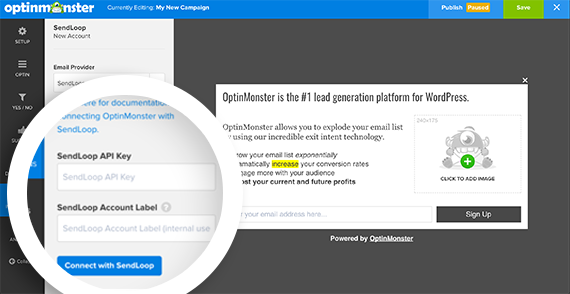 Now it’s easy to set up targeted OptinMonster campaigns to segment your subscribers into different lists. Smart marketers use email list segmentation to drastically improve the effectiveness of their email marketing campaigns, because personalized emails deliver 6X higher transaction rates. Find out how to segment your email list like a pro. See our new doc for step by step instructions and details on how to set up your Sendloop campaign with OptinMonster. Not using OptinMonster yet? If you’re ready to try out OptinMonster’s new Sendloop integration, try OptinMonster today to find out why it’s the most powerful conversion optimization software in the market.